The Korean Wave, Hallyu, refers to the global popularity of South Korea’s cultural economy exporting pop culture, entertainment, music, TV dramas and movies including Korean pop. K-Pop has become a truly global phenomenon thanks to its distinctive blend of choreography which is synchronized to perfection, addictive melodies and of course the very attractive South Korean singers. 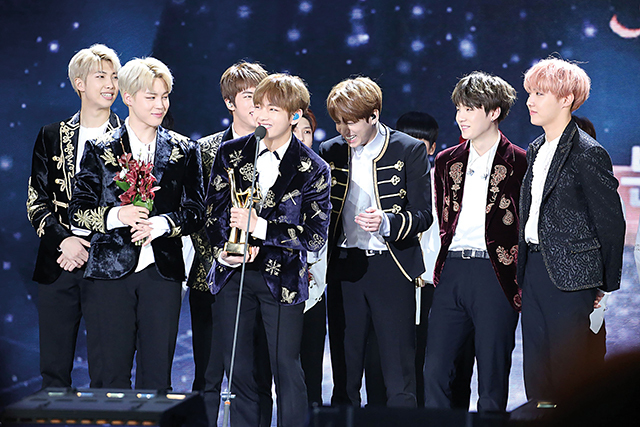 Korean culture has becoming globally popular in the past 10 years and has hit the charts many times especially groups such as BTS and Wonder Girls who essentially had the first massive hit in 2009 with “Nobody” which was released in four different languages. In 2018, Korean pop became a $5 billion industry. During the Olympic opening ceremonies on February 9, 2018, athletes marched in the Parade of Nations to the accompaniment of a select group of South Korean pop hits which was intended to show the world that Korea has fully integrated as a part of the global culture. One very popular group is an all male group called BTS who even made it onto Irish headlines with the independent.ie who said that they credit their worldwide popularity on the universal themes of their music. If you search Korean pop online or on Youtube, BTS is most likely the first group to appear. This is because they are the first Korean group to be nominated for an American Music Award and they are known for their large social media following. Last year they were the most popular music group on Twitter, according to the Guinness World Records. The band, made up of V, Jimin, Jin, Suga, Jungkook, RM, and J-Hope, took part in a sold-out talk at the Grammy Museum in Los Angeles and discussed their popularity. Speaking through a translator, Suga said young people have similar experiences regardless of where they grow up in the world and they believe this is the reason for their fame. BTS only debuted in 2013 yet they have produced six albums and their fans who are known as the “BTS Army” have been loyal since the beginning by lining outside hotels and venues to greet band members. It’s not only the male groups that are popular, with an all female group called Twice who rose to fame with their first ever single “Like Ohh Ahh” in 2015. With nine members and six albums under their belt, there’s a lot to keep up with when it comes to Twice. They are so popular that it only took 22 hours for their single “Likely” to reach 10 million views. Big Bang are another major K-Pop group worthy of mention. The five-member group started in 2006 and are signed under YG Entertainment. In 2007, with their song ‘Lies’, Big Bang opened up what many have described as the “golden age of K-Pop”. The group now has 4.8 billion views on their Youtube channel and have won awards such as Best Worldwide Act, two Japan Gold Disc Awards, and an Artist of The Year Award among many others. However, in March of 2018, Big Bang released a song called “Flower Road” with lyrics such as “this is not the end of us” which served as a final farewell from the Korean act to its fans ahead of a lengthy hiatus, as the band members serve in South Korea’s military. The title refers to a Korean term expressing a new, glorious journey and refers to the careers of the band members and lives of the fans. Korean pop is still making waves globally and it is really only a matter of time before it is a regular appearance in the charts.